I've been working on something I'm very excited about…a proper way to organize my outfits that is easily accessible. Normally I try to take 4"x 6" photos but I just have a big stack of these in my closet which isn't too handy when you're in a hurry, flipping through each one to see what to wear. I decided to make my own Style File. Ummmm….why didn't I do this before??? I'm LOVING these! 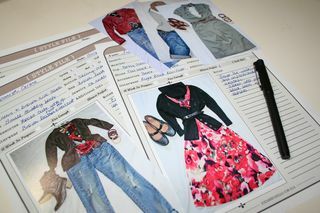 I can't wait to get all of my outfits on these pages and organized into seasons. I know this is to be indispensable when I travel since I will be able to quickly pick my outfits and then pack directly from the pages and I won't forget anything. It's so easy! 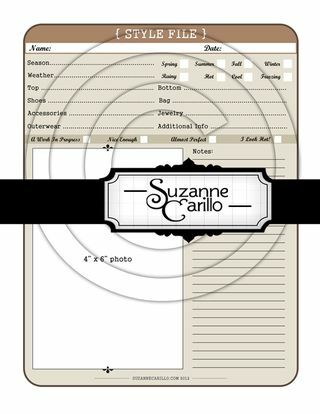 Once you print out the design add your photo, fill in the blanks, insert into a page protector and then into a binder. 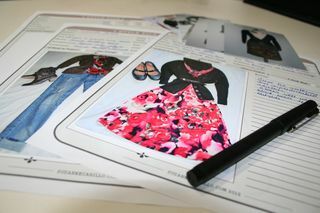 You'll have your own personal "What to Wear" scrapbook. I also think this is a great way to keep in mind what you have in your closet. 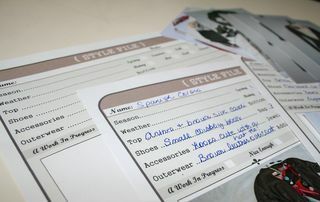 Another option for the pages is to use them as a style board and pick out items from magazines that you like and add them to the page to create new outfits, like a wish book. This year though I'm going to try hard to do a whole lot more "shopping in my closet" so I will be staying away from that. I just know my girlfriends are going to love this! Especially when I've taken all that time to style them and then they don't remember what went with what. With the New Year it's a chance to get my closet and outfits organized and have easy access to "my style". Love love!